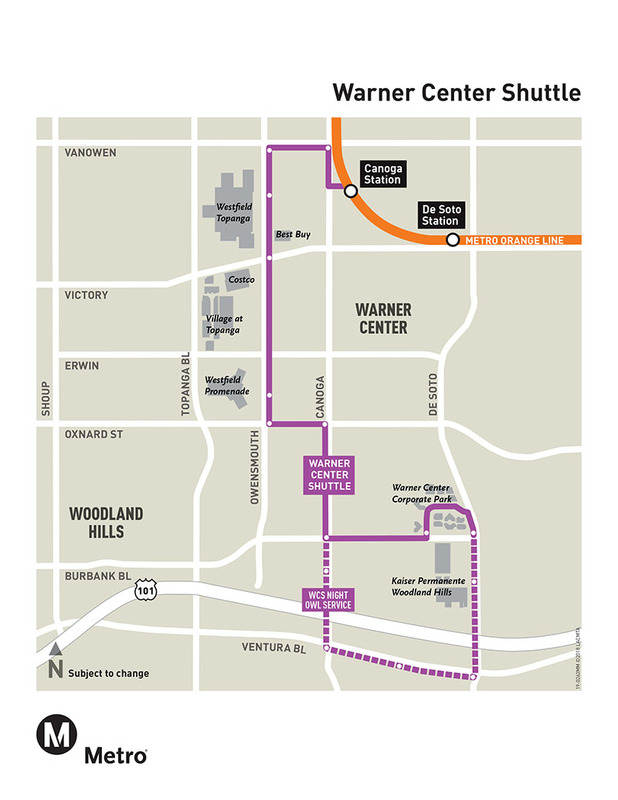 New Shuttle bus service has been implemented in Warner Center to replace the existing single Orange Line stop at Warner Center Station. Operating from the Canoga Orange Line Station, the new Shuttle provides 10 new stops improving access to Westfield Topanga, The Village, Warner Center Corporate Park, Kaiser Permanente and other nearby locations. The Shuttle operates seven days a week, every 10 minutes during most times of the day. Late Night Owl Service extends south to Ventura Bl seven nights a week from 9:30 pm to 4 am. After serving the stop on De Soto Av and Burbank Bl, the Warner Center Shuttle continue south on De Soto Av and resume its regular route. This change will allow connections to late night service provided by Line 150. A map of the nightly route and stops is shown below. The Shuttle costs the same fare as any other local ride on the Metro system, $1.75 one way. When using a valid TAP card, the fare includes transfers to other Metro lines for up to two hours to complete a one-way trip.